How do you treat your elderly clinic patients for chronic pain? As noted on the Pallimed blog, a study published last week in Annals of Internal Medicine reports on adverse events associated with the prescription of opiates for chronic non-cancer pain. I'll confess that when this article caught my eye, one of my first thoughts was "Argh! Now it will be even HARDER for me to persuade my elderly patients to try a little low-dose opiate for their severe arthritis, when all else has failed to control their pain." Yes, it's true. 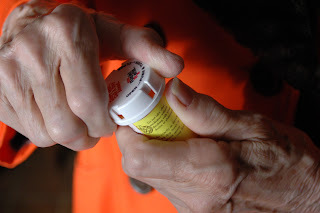 I have some of my arthritic elders taking a little daily opiate for their pain: it allows them to walk around a little more and maintain their function, or so I tell myself. But what do the rest of you think? In particular I'm curious to know what the primary care clinicians among you prefer to use for chronic noncancer pain in frail elders. And how easy do you find it to address the patient's (or often, the family's) worries about the risk of addiction or overdose? Will this latest study change your practice? I'm no longer a PCP, but it's only been six months and I practiced primary care for 20 years. I used opioids, both short and long-acting, in my elderly patients and I would still do that if I were still in primary care. All meds have side effects, especially in the frail elderly. Adjuvant antidepressant meds cause sedation and increase fall risk as much as benzos and opioids, and don't work as well for musculoskeletal pain. NSAIDs are not exactly benign, especially for patients with diabetes. Overall I think the risk-benefit ratio for opioids is still pretty good. 1)The American Geriatrics Society recently published a guideline on the pharmacologic management of persistent pain in older persons. This guideline recommended that in elders with persistent pain, opiods be considered first line therapy in preference to NSAIDS. This reflected the opinion of the guideline panel that the adverse effects of NSAIDS are potentially greater than those of opiods in elders. 2)The discussion on Pallimed suggested that one potential bias in the study is that episodes of delirium may have been misattributed to opiods. I agree this could be a serious bias. The diagnosis of delirium is actually more complex than considered in this study. Over the past decade, in part because of the landmark work of Sharon Inouye our understanding of delirium has greatly advanced. We no longer view delirium as a diagnosis that has a single diagnostic cause. Instead, we recognize delirium as a geriatric syndrome in which multiple risk factors act together to cause delirium. It is the number and severity of risk factors and precipitating insults that pushes a patient into delirium. For example, consider a patient on chronic opiods who develops pneumonia, along with fever and dehydration. If the patient develops delirium, it would be almost impossible to attribute the delirium to opiods. Rather, it would be the synergistic combination of infection, fever, and dehydration that precipitated delirium. It would certainly be possible that the opiod was one of the precipitating factors. But it is important to remember that many medicines can cause delirium, including many medicines not commonly recognized as psychoactive. There may be an excessive tendency to assume the opiod is the culprit rather than other medicines. It also needs to be remembered that pain can also be one of the factors that contributes to delirium risk, so that underdosing opiods may also contribute to delirium risk. 3)While the article shows that opiods sometimes result in serious adverse effects, the rate does not seem that high. Are the rates of serious adverse effects of opiods any higher than rates of serious adverse events of many other drugs we commonly prescribe for chronic conditions? For example, how do these rates compare to rates of hyperkalemia with ACE inhibitors, or GI bleeding with NSAIDS? Previously on GeriPal, Mike Steinman discussed a useful way of thinking about the preventing serious adverse effects from medications.. At the time of prescribing, you weigh the potential benefits and adverse effects. But after you prescribe, you carefully monitor what actually happens, and you modify how you prescribe the medicine to maximize the benefits and minimize the harms. I am not sure there is a compelling reason to believe there is anything much different about the use of opiods in this respect than other common drugs. This is an important and common issue. Where I work I frequently see hospitalized elders with arthritis pain. As Leslie is aware - and I know this is controversial - I like to prescribe tramadol. Why? Because it may be the least bad option. NSAIDS, as discussed and noted in the JAMA editorial that accompanied the new AGS pain guidelines, should be avoided in the elderly. I believe the subheading of the editorial was "Avoid NSAIDS, consider opioids." Short acting opioids like morphine and oxycodone have a bolus effect that puts patients at risk for the twin harms of oversedation/delirium and undertreatment/hypersensitization. Long acting formulations (MS contin, oxycontin, fentanyl patch)are too high to for opioid naive patients. Tramadol is a weak opioid that although it's dosed every 4-6 hours, seems to be effective when dosed bid in my clinical experience. I start very low - 12.5mg BID. There is a long acting formulation that starts at 100mg/day, and I rarely get to those doses. It has some NMDA receptor activity, so like methadone, is useful for treatment of patients with neuropathic pain. The problems with tramadol are lowered seizure threshold, so I avoid prescribing it for patients on anti-depressants, and the same delirium potential of other opioids. I'm not saying I take a cookie cutter approach to treating arthritis pain with tramadol. I use other opioids as well. As Ken mentioned, I don't think the side effect profile of NSAIDS is better than the 0.5% risk of side effects from opioids. The number I recall is about 1% risk of GI bleed from NSAIDS over a year, in addition to effects on renal blood flow, increased risk of heart failure, and possibly interferring with the cardioprotective anti-platelet effects of low dose aspirin. Great post! Please feel free to lay into me for using tramadol...or maybe I'm not the only one?